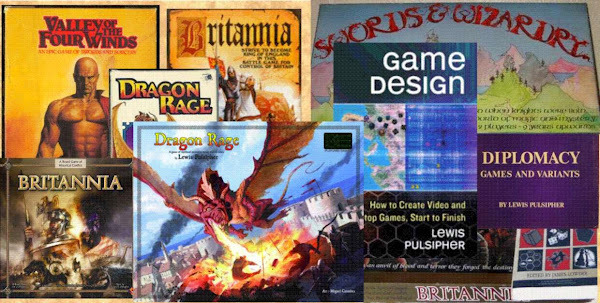 Pulsipher Game Design: The virtues of cards in "boardgames"
The virtues of cards in "boardgames"
I am going to try to summarize the virtues of using cards in boardgames--or perhaps in boardgame-card hybrids. I'm doing this primarily for the benefit of my students, but I thought it might be worth contributing to others as well. • Cards can be used as a substitute "board"
"Put the rules on the cards". This is the easiest way to simplify the difficulties of learning a game, especially for those teaching it to others. A player only needs to consider/understand the card-rules when they hold or draw the card. Well-known collectible card game designers introduced me to the "seven line rule": players won't read more than seven lines of rules on a card, so don't put more on them. For millennials the rule is certainly "the less text the better". This is also a good way to reduce the size of the rulebook. Big rulebooks are daunting even if the game itself is fairly simple. Cards often host attractive color graphics, much larger than you can put on tiles or counters. They are cheaper than sculptured three dimensional figures. 3D figures are seldom multi-colored, too. "Chrome" is the term for special rules that often reflect special historical or personal circumstances. Hence chrome usually involves rule exceptions. And where "chrome" includes a visual, a card is the best way to illustrate/introduce it. This relates also to the first point, putting rules on the cards rather than in the rulebook. If I designed Britannia today I might include cards to add "chrome" to the game. A variant using "Nation Specialty Cards" already exists (my design, not released). When players need to keep track of what items or spells or capabilities they possess, cards are an excellent choice. They're familiar, easy to organize, and have both text and graphics. For example, spells are tracked in EL:the Card Game (see below) via cards. "Event cards" are quite common in games these days. Lots of different scnearios/situations can be introduced in a small deck of cards. The variety of the cards usually increases replayability as well. More possibilities equals more paths that the game can follow. Players can play many times and still be able to say "I never saw that happen before". Cards can be used as a substitute "board"
I've devised several prototype games that use cards in place of a board. From a commercial point of view, this results in a much less expensive package that is easier to ship and to find shelfspace for. In Battle of Hastings some of the cards represent Saxon and Norman units; the play area is so crowded until late in the game that the cards can be arranged in a 7 by 6 array of "spaces", though I also have two strips, one to either side, to help orient the rows. In Enchanted Labyrinth: the Card Game (derived from EL the boardgame) some of the cards represent the "dungeon" being explored by wizards and their minions. As creatures move into new areas, the cards are turned face up to reveal the contents of the area. In Zombie Escape, face-down cards represent the building (a reform school) that the players try to escape from in the face of zombie infestation. Once again, discovery occurs when players move onto the card areas. Many people now dislike dice rolling, if only as a reaction against the random "roll and move" mechanic so infamous in older American family games. People believe (and sometimes it's true) that they can manage cards in a way they cannot manage dice rolls.